Marcello Averburg, Hugo Benito, Cecilio Berndsen, Alfonso Caycedo, , Clara Estrada, Emilio Labrada, Alvaro Lopez, Orlando Mason, Ítalo Mirkow, Alfonso Sánchez,, Ricardo Zavaleta, German Zincke. Although Greece is one of the world’s most ancient wine producing regions, it has remained relatively under the radar…until now! In the 1990s the Greek wine was in high swing, trying to catch up with the modern wine world. Greece boasts tons of world-class wines with bright and diverse personalities. Greece greatest asset, but also perhaps a reason why the wines are hard to sell, is its palette of indigenous varieties, many noble, and most far more ancient than the likes of Cabernet. Nemea has been regarded as a great winemaking region since the time of the ancient Greeks. Recent archeological excavations have revealed winemaking being done here over 3500 years ago. 3) Gaia, 2007. Rojo Agiorgitiko. Pelopnnese. The colour is straw blonde, bright, with a nose of ripe citrus fruit followed by a refreshing acidity and a delightful after-taste. Blend of 75% Assyrtiko and 25% Athiri. Medium gold colour with aromas of honey, almonds, moussasaka and gallaktaburiko (Greek custard pastry). Superb balance of sweetness and a touch of bitterness leading to a powerful conclusion. Acidity is completely under control despite the Assyrtiko’s reputation as a grape with high acidity. A long damp peach finish that grows withs intensity and fades so very slowly. Greek personality personified! This is no tourist wine to be quickly consumed with the setting summer sun. Fermented in stainless steel and oak. The alcohol content of 14.2% sure doesn’t show in the glass in a flashy way. It is extremely well integrated. Founded by George Skouras, a Dijon qualified oenologist, in 1986, this domaine is amongst the country’s finest and has gained international fame along with distribution in 16 countries. Skouras makes a range of 15 wines from both indigenous grapes and from international varieties, and he achieved notoriety in the 90’s when he was the first winemaker to blend Cabernet and Aghioghitiko, with spectacular results. Made with organically grown grapes, from 20 + year old vines, the 2010 Saint George is an entry level Aghiorghitiko. It is planted in clay soils at 650-meters above sea level. Fermented and macerated in stainless steel vats, it undergoes maloactic fermentation and is then aged in French barriques for 12-months and another six in bottle. It exhibits fine grained tannins, intense raspberry fruit and sweet spices. The colour is bright, deep crimson. The nose reveals aromas of blackberries, raspberries and ripe strawberries with just a touch of anise and spices such as clove and cinnamon. It is a medium bodied wine with graceful silky texture, balanced acidity and very ripe elegant tannins. The finish is moderately long, full of red fruits with a touch of sweet vanilla and black pepper. Gaia Wines was founded in 1994, north of the Peloponnese, in the area of Koutsi, Nemea (2100 feet elevation), regarded by many as the premier site for growing Agiorgitiko grapes in Greece. This excellent example of modern Greek winemaking is an outstanding new world wine from old world grapes! Gaia Winery own two modern wineries that are located in two of the most interesting and promising areas of Greece, Nemea in Peloponnese and Santorini. In 1999, their most prestigious wine, «Gaia Estate vintage 1997», were born. 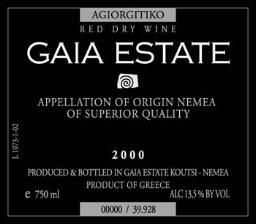 It would be true to say Gaia Estate was the wine that changed the perception of the Nemea wines and brought a more sophisticated dimension to Agiorgitiko grape, that of deeply aged wines. Now, Gaia Estate is the flagship red wine from this winery. Sweet, serious, velvety and dark rubi in the glass. Great depth and complexity with loads of black and red fruits with powerful yet smooth tannins. In the mouth, flavors of redcurrants, mulberries and cherry mix with a crushed stone minerality and very velvety. Excellent acidity makes for a refreshing, juicy package that possesses and airy, floral finish. This dry red wine is both bold and supple at the same time, and will benefit with some age. It is a wine with great potential of ageing. Complex and dynamic, a perfect example of why Aghiorghitiko is such a fantastic grape. A top red not just from Gaia Estate, but in the whole of the Mediterranean. 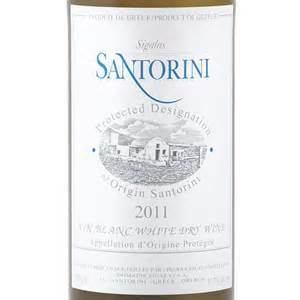 Athiri is an ancient white grape variety of the Aegean Sea, used for centuries to make excellent dry white wines. Ever since its qualities were recognized by vine growers across Greece, it has been an elegant expression of the style of white wines produced on the Cyclades and Dodecanese islands. Perfectly suited to arid and warm Aegean conditions, this vines is able to perform in a large variety of soils. It makes wines with moderate intensity of flavors, mainly focusing on white and yellow fruits, with moderate alcohol levels, soft acidity and a medium body, displaying freshness and vivacity. Athiri is grown all over the Aegean Islands and is important even in Crete. Nevertheless, numerous vineyards have been planted in the mainland, most notably in Macedonia, particularly in Halkidiki (PDO Côtes de Meliton). Nevertheless, the top results are achieved in PDO Santorini—when it is coupled with Assyrtiko and Aidani—and in the high vineyards of PDO Rhodes. The lean, not heavy structure and the lack of obvious flavors make Athiri wines suitable for a large range of difficult-to-match dishes. However, Greeks enjoy it as an aperitif, especially on warm summer lunches. This is a grape variety to be consumed young, within two to three years from vintage, although some five-year-old examples have been found to be delicate but complex. Aghiorghitiko is a red Greek winegrape variety that, as of 2012, was the most widely planted red grape variety in the country. The grape has traditionally been grown in the Nemea region of the Peloponnesebut can be found throughout the country, including Attica and Macedonia. According to Master of Wine Jancis Robinson, some of the “most serious examples” of Aghiorghitiko come from the higher altitude vineyards (up to 900 metres / 3,000 ft) of the Asprokampos plateau around Nemea and in the hills (between 500 metres / 1,600 ft to 600 metres / 2,000 ft) around Koutsi in Corinthia. One of the more commercially important indigenous Greek varieties, it can exhibit a wide range of characteristics, from soft to very tannic, depending on factors in the growing and winemaking processes. The red wine produced from the grape is characteristically spicy with notes of plum. It has low acidity but good fruitiness and coloring. Aghiorghitiko is a very versatile grape variety that can be made in a wide range of styles from light rosés to soft, fruity reds made by carbonic maceration in a style similar to the French wines of Beaujolais, to very tannic wines with spicy, red fruit aromas and the potential to age. At its most extreme, Aghiorghitiko wines have the potential to be very low in acidity, high alcohol and high in phenolics with both issues requiring the winemaker to make decisions on how to handle these components in order to make a balanced wine. According to the Wine & Spirit Education Trust (WSET), the best examples of Aghiorghitiko tend to have moderate to low acidity, with a deep, ruby color, red fruit aromas and a sweet spicy note. These examples tend to come from vineyards planted in the middle range of the hillside slopes around Nemea with grapes harvested near the top of the 900 metres (3,000 ft) hills. In Nemea, the wine made from Aghiorghitiko is nicknamed the “Blood of Hercules” because of the legend that after the Greek hero slayed the Nemean lion, it was the local Nemean wine made from Agihorghitiko that he consumed. (Some versions of the story has Hercules consuming the wine before slaying the lion.) Another legend states that the wine was a palace favorite of king Agamemnon who led the Greek forces during the Trojan War. prepared by the the Club Secretary Ricardo Zavaleta. El primer vino (blanco) fue calificado como Muy Bueno con promedio de 88 puntos; el primer tinto, como Muy Bueno con una Media de 87 puntos y el segundo (tinto) ultimo vino, también como Muy Bueno con una calificación media de 88 puntos. En resumen todos se consideraron como Muy Buenos. 2010 Sigalas, Blanco. Domain Sigalas. Region de Santorini. Impresion General: Un excelente Blend (Assyrtico y Athiri) agradable sabor y con un fresco aroma. Resulta un vino muy sabroso y balanceado. 2010 Saint George, Rojo. Aghiorghiko Domain Skouras. Region Nemea, Peloponnese. Impresión General: Color granate brillante, con aromas a diferentes frutas y especies dulces. Gran elegancia en su acidez como un vino de medio cuerpo, con un final moderadamente largo. 3. 2007 Gaia, Rojo. Agiorgitiko. Gaya State, Peloponnese. Impresión General: Se considera un ejemplo de vinos modernos, entendiéndose que es un vino mundialista elaborado con viejas cepas. Color rubi, gran profundidad, sabor agradable y refrescante. 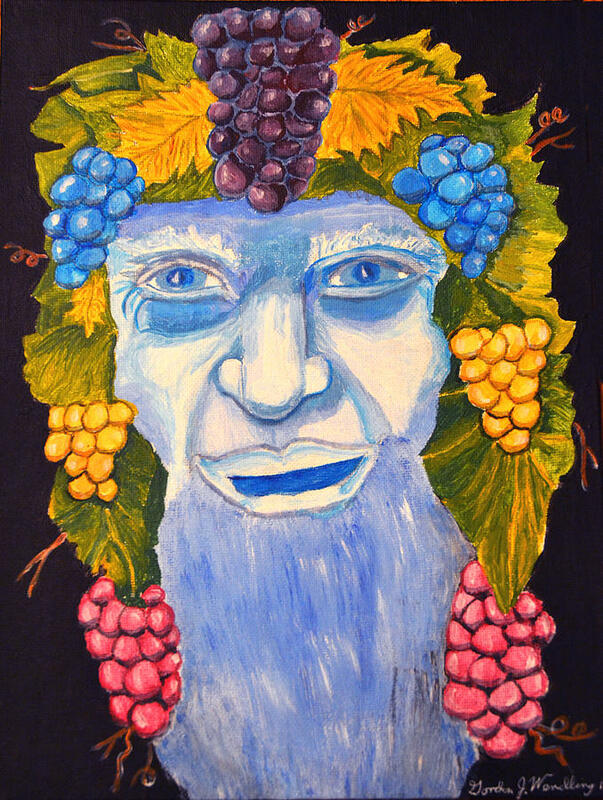 This entry was posted in Meeting Abstract and tagged Aghiorghitico, Assyrtico, Greece. Bookmark the permalink.